Some of this blog is 'life here' and some of it is 'What God is doing Here'. This is a 'What God is doing here' post. The child above is holding a megavoice player. The Megavoice is an affordable, long battery life, simple to use digital audio player. We use it to put audio Bible's on and give to people who are illiterate. 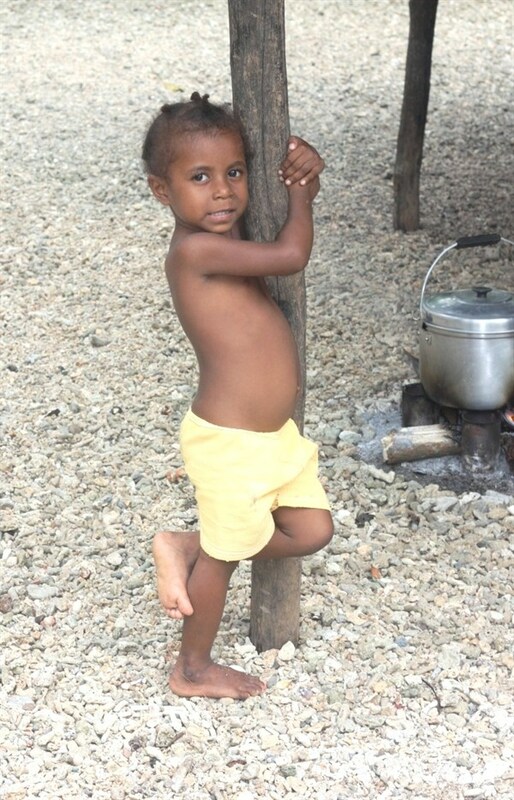 The Pinai-Hagahai people aren't a huge people group, it has around 1000 people in it. Several years ago a couple moved here to translate the Bible into their language. They were met with all kinds of trouble and hardship. Their house was moved several times, then burned down. They were held up by gunpoint, and many other crimes and troubles. Their furloughs were difficult, their time in country was difficult, and if not for the prayer and support of others, they would have never made it through those tough years. 3 - we have our own recording specialists who go into the village and record mother tongue speakers reading the Bible that has been translated. These translators, had rough times, and in a fit of creativity, bought 70 megavoice players, put the four Gospels and Acts on it and GAVE it to the nationals in the village. They gave it, because they had funding. It's a bit of a taboo to 'give' because it means that there is little value on the item. If they were charging for the item then perhaps the people would take care of it, and not abuse or lose the player. But, because of how remote the village was, they had no cash economy whatsoever. So according to 'how we do things'... giving the megavoice players was not a wise move. It wasn't technically 'the right thing' to do. But they were finding the elderly and also young men were being excluded. The church was full of women and children.... and they wanted to do something. So they distributed the 70 megavoices, not hoping for much and went on furlough. Markus (the ex-pat translator) tells people that joining the goal of Bible translation is like joining the marines. It's hard work, lots of training involved, you're on the front line, and you may be in danger... but when you're ordered to go,... you go. When they came back from furlough the results were beyond their wildest dreams. People had taken to listening to the devices as their daily devotions, as their bible study. They interviewed 100 people, which is 10% of the people group and every single one of them had changed their lives to Christ. The revival had begun. And it was no act of man. Since then the people have asked for more, and they have distributed 400 more megavoices (with funding from people back home). 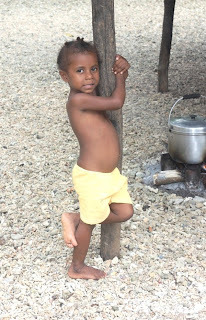 Right now, there is a two man team in a village far into the Sepik doing audio recordings so that we can reach more people who can not read.... in a different language group. But it's a very hard location to get to, and they've been stuck there for much longer than they expected to be because of the road conditions and inability to fly in or out. They are separated from their families, while doing this work. God's word endures. We're trying to get it to people in a way they will understand it. Through all the work, and hardship that happens, we know, because we've seen it so many times... that once people get the Gospel in their heart language, it changes their lives, and the enter into a meaningful relationship with Christ. We pray for good discipleship of these people. Political and military tensions have risen in Port Moresby, capital of PNG. A quick summary of the background is as follows. While long serving prime minister, Sir Michael Somare was under long term health recovery in Singapore, parliament voted in a new Prime Minister – Peter O’Neil in Aug 2011. This was subsequently challenged in the Supreme Court of PNG, who ruled in December 2011 that this vote was not constitutional. Parliament immediately had a re-vote, re-confirming O’Neil as Prime Minister. That piece of political activity happened peacefully, with the police and military remaining distant. This morning, it is confirmed that certain elements of the PNGDF , led by a Col Yaura Sasa , have place the Commander of the PNG Defence Force, Augwi under “house arrest”. Col Sasa has stated in a press conference that this is not a coup and that they are calling both sides to recall parliament and uphold the Supreme Court decision reinstating Sir Michael Somare. He reiterated that they are only trying to protect the Constitution . As always with these situations , any trouble or risk, is currently localized around the specific locations in Port Moresby. Most business in Port Moresby are closed today and we have no reports of trouble in other towns. Our Port Moresby staff are monitoring the situation and avoiding any unnecessary travel. Air Niugini have cancelled nearly all their flights into Port Moresby as a precaution. We have no reason to believe that any SIL staff would be targeted, if this situation escalates. However, both side have weapons. Please pray that a peaceful solution will be reached. Many of you know bridges and erosion caused by rivers are a constant battle. 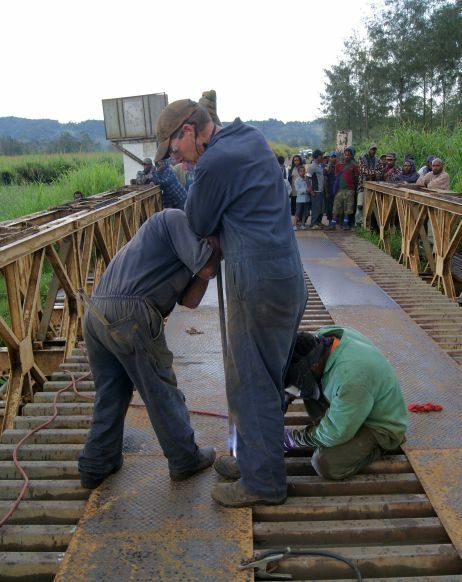 In this pic our industrial and maintenance folks repair our only bridge to on center. They are putting on thick sheets of steel to help fortify the bridge and give traction. The river beneath has been growing, but they also are putting gabian baskets in place along the edge of the river. yesterday we were outside heading to school and a spider jumped onto my daughter. I said 'sydney there's a spider on you!!!!' pretending to be all panicky. She gave me a roll-your-eyes look, reached over, grabbed the spider with her fingers, squeezed and tossed it away. The look said it all "dad... geez, don't be such a girl." I was trying to scare her, but apparently spiders don't give her cause to be squeamish. Neither do mice apparently. A mouse jumped out at her yesterday and she said "dad, I've finally seen the mouse, I think you need to trap it." Could a dad be more proud than to raise a daughter who doesn't flinch at such things? This was a weird week full of odd technical problems. One person had somehow created a nested loop of email automated replies such that when 1 person sent her an email, over the course of 2 weeks, her inbox filled to 170,000 "I am on vacation" emails. That took hours to fix, but on Friday we fixed it. As I decided to move to plan B on linking up a satellite office, having tried to splice fibre and failing repeatedly (something we know how to do and have done).... I walked outside and saw this picture. It may not look like much, but those cubicles are translator cubicles. The open doors mean there are people in there (you can't see them but I did) sitting down with books and translating God's Word. Open doors, mean people, people mean work, work means translation. Translation means changed lives. So it was awesome to take a moment step outside and see people translating God's Word right there in front of me.... as a little reminder "Chad, this week has been wierd, but this is what you're supporting!" I love ending the week on a good note, and I got a special encouragement today. we have a Dot net nuke module that has been complaining of 'max number of concurrent sessions reached" which has the server dropping email to people all over the world. We attempted to fix it earlier this week and couldn't find the root cause. I thought I had fixed it by boosting the max concurrent sessions in exchange 2007. But it didn't fix the errors, and so, the 1 guy we have (our 1 webmaster) is going away for 6 weeks... we decided to leave it until he returns. Then around 4pm today, I was looking at our network traffic graphs and saw an odd pattern. It hit me that email was having an issue, so I started digging through the queues. I found several emails from the same problematic server bogging up our internet connection. It dawns on me after reading through the mail headers that I see that the SEND connector for exchange 2007 linked to another send connector on Exchange 2010... so I boosted THOSE numbers as well for the max concurrent connections, and.... bingo... the problem resolved itself within 1 minute. I love it when good honest detective work gives you a theory and you test the theory and it works, and you resolve problems RIGHT before the weekend. I do not like going into a weekend with unresolved urgent issues. So long as there is a problem to be solved, my mind doesn't allow me to rest. My wife knows this about me, which is why she no longer says right before we go to sleep "oh yeah, and the faucet in the kitchen is dripping." Because she knows that I will toss and turn all night as my brain works out how to resolve the issue and comes up with a plan. Anyway, the point is, it was glad to end a week of weird tech problems with a few solutions. Sorry I've been less than communicative lately. The days fly by. I find that while I committed to myself to take more photos and videos to share to everyone, that I haven't done much of it at all. My job is very busy, and I find I end up crashing on the weekends to prep for the coming week. We've found some new technology (a sim card wireless router the Global Surfer III) which is proving to be very handy here for the translators. I'm still trying to get Buka online. Send a couple out to the village last week with a radio setup, we spent a day on that, but when they arrived they found someone had stolen their solar panels. So they used plan B (a netbook with a cell phone modem dongle (huawei) ). 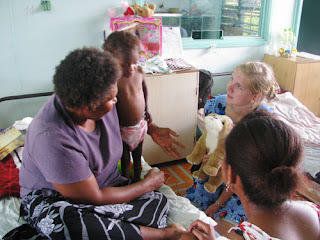 They had almost no power because of the loss of solar panels, so the netbook was helpful to them. I'm finding that the day to day work of running this place is becoming far too overwhelming. More people are returning with more gadgets and more needs and we simply can't keep up with the demand. We lost a good couple of workers not long ago, and are looking to lose a few more. So Feb/March/April/May is going to be my 'dark' quarter. I will be overworked to the point of being unable to spend a lot of time blogging. We have REALLY enjoyed the christmas cards/letters/facebook notes we've received. IT helps to know we haven't been forgotten. -in spare time I'm working up a web site for an idea I have that might prove to be helpful to the community. I'm not a web master so I'm finding the project educational. -twice a month our band gets together to practice. We have a fiddle, mandolin guitars, and my banjo now.. so we're getting a nice folksy sound going. I know.. what kind of geek works all day at computers and then comes home to work at a computer? Well not me usually... usually I unwind by playing some music or playing a game or watching a show. But from time to time I get these ideas that I think would help the people living here, and I go for it until it turns out to be a good or a bad idea. Anyway, the summary is... I'm tired. Work is transitioning to more of a managerial role which is taxing to me. I enjoy the interpersonal portion of it, but the amount of paperwork is overwhelming (at least at first). I'm thankful to be here and doing work, and that I get to say even on the 'hard' days, that it's all a sacrifice of worship. I sure do like that. Back in the U.S. if I had a bad day, I had to drive home in congested traffic, in the city, and get home and grouse about the bad day I had. Here, I have a bad day, go outside, see this beautiful country, get home and instead of grousing, I think 'when I have bad days, if I can handle it with a good attitude it's a sacrifice of worship to God'. Knowing that God appreciates even the efforts that yield very little (at least for that day)... is enough to keep you going. we need to get these places online quickly because we don't have the resources to be spending hundreds of man hours on it. We're coming to the end of the rope on these projects rather quickly. Every year Kendal and the kids help with a local version of Vacation Bible School. Kendal this year is in charge of the administrative tasks (registration, name tags, organizing groups, etc). Both kids are student leaders and helping out with small group activities. It's a lot of work for a week, but it is very rewarding. Thank you Kendal. About 60 kids were counselled for salvation today. Thanks again for your great organizational skills! Bathsheba and Rahab were two girls, obviously named from the Bible but we're not sure if the kids folks knew who those people were in the Bible and then, a boy named Debbie. We often find the PNG naming practices confusing but interesting. At first site it seems like something you can sort of chuckle about, something getting lost in translation. But deeper insite makes you realize that while these folks obviously read some part of the Bible, they didn't quite fully understand something about it. That's what happens when you want to read the Bible but it's not in your heart language. You don't fully understand what is going on, you don't fully grasp the truth until it's in your language. This week's VBS is about getting God's Word communicated to children. Often as translators we focus on the adults, because they are the ones with the full grasp of the language. But VBS is just for kids. Another interesting fact. This VBS is for kids ages 5 to 8th grade. But on the first day they allow everyone in. WHY? Because when word of there being fun training, Godly teaching for kids gets out, people come from long distances, all the nearby villages and further, and when they arrive they find out "oh high schoolers can't come? Our babies can't come?..but we came this far from the village?" And so on the first day, everyone is allowed. Of course no one gets turned away, but VBS isn't a daycare or a preschool, it's meant to lead children down the path of salvation. So the rules are put forth with the hopes that a majority of people will follow them. And for the most part they do. But the response is overwhelming... hundreds of kids come. Saturday we helped one of our friends do some tear down. Another side ministry is the care of our single friends. Well really the care of all friends. Sometimes there is (pardon the sexism) "man work" that needs to be done. This time that work turned into fun. Our friend Donna is a single lady that seems to always find a way to turn work into fun. What's better than tearing down a building? Doing it with the community. As a community we also tore down a rotting tree house and then turned it into a bonfire. I brought my sledge hammer and had some fun. We drank wassail. We ate 'damper'. It's an Aussie tradition of bread on a stick that you roast over the fire. Epiphany is also called 'three kings day'. I didn't take this image, I wish I had. I seem to have plenty of opportunity to snap photos of lightning and never actually get one. We were out in the valley with some of our PNG friends, supporting them with a visit and we saw a huge lightning storm off in the distance (towards our home). It's really a remarkable thing to be outside in the rain, on a plain, watching lightning strike the hill tops. Lightning and electronics don't mix. One time in 1990 we had a thunderstorm that killed our PABX (telephone switch) and left us down for 4 days. This last thunderstorm did a little bit of damage as well, it took out a few telephones. But the biggest damage, was a friend of ours whom I work with, was at home, in their living room when their house was hit with a bolt of lightning. She said 'the entire living room lit up and it was like a bomb went off in our house' She is a really great christian Papua New Guinean lady named Lucy, and she has been working for my department while trying to find work closer to where her husband lives. She said 'there was no hole in the roof, but the floor had a huge hole in it'. Thank God they were all okay. What a thing! To have lightning hit your house, while you were home, right in the middle of your family... and no one get hurt! Praise to God for protecting her family.